Depending on the source, perhaps in North Carolina, or more likely in Jonesboro, TN, a baby girl was born in slavery. Given the conditions in which slaves were maintained, it is not difficult to understand why the child’s birthplace is so difficult to establish. 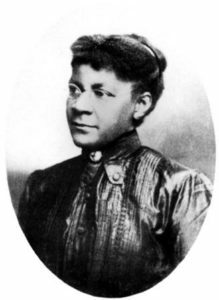 Her parents may not have been allowed to marry; in some places, African Americans were prohibited by law from marrying. The date of this little girl’s birth is not known for a certainty. Historian Ellen Baumler gives the day as Christmas Day, and the year as 1852, 1855, or 1856. Other sources are more certain that she was born in 1852. She was named Sarah, and her mother’s owner – and therefore her owner – may have been John Blair III, a Tennessee landowner who died in 1863. Settling his estate may have been the cause for selling both Sarah’s mother and father, Dr. Baumler suggests. At any rate the parents were sold, Sarah later told people, and she never saw them again. We can only guess at the lifelong heartache this must have caused both the parents and their daughter. Sarah went to live with her aunt and uncle, who were both free blacks after slaves were freed by the Civil War. She changed her name to Gammon, her aunt’s surname. At this point the circumstances of her life become more clear. In 1871, she traded passage to Virginia City, Montana Territory, in return for looking after the children of John Luttrell Murphy, the newly appointed associate justice of the Montana Supreme Court for District One in Virginia city. Although Murphy remained in Montana, Sarah stayed until the end of her days, in 1931. In 1872 she married a successful African American miner named John Brown, who became abusive of Sarah and the children, two boys and a girl. The boys died of diphtheria, and Sarah fled. In November 1880, she divorced Brown. Montana had provided abuse and abandonment as just causes for divorce since the first legislative assembly in 1864, and Sarah had ample cause. She also had an able advocate in Samuel Word, who was widely known and respected as having been among the first settlers in Alder Gulch. Eventually, John Brown died. In 1882 Eva died at the age of nine. Her heartbroken mother married again In 1883, this time uniting with Stephen Bickford, a white miner and farmer who had come to Montana during the 1863 gold rush. They had four children. In 1888, the couple bought a two-thirds interest in the water company, and for two years Sarah kept the books. As a side business of her own, she ran a truck garden from which she sold garden produce and poultry to local customers. After Stephen Bickford died in 1900, Sarah bought the last one-third piece of the Virginia City Water Company, becoming sole owner. Having no education in managing a business concern with all its assets and debts, and employees, Sarah took a business correspondence course. (Correspondence schools were the equivalent of accredited online education before the Internet.) She coped single-handedly with all the problems a business must face. Among other problems, she handled complaints about water quality, delivery of an inadequate supply, and disputes about bills. Human nature being what it is, undoubtedly people complained about a woman – and a black woman at that – owning a utility company. But she persevered, despite everything, including even business turndowns such as the Panic of 1893, and those of the early twentieth century. Eventually, she bought the “Hangman’s Building,” where the Vigilantes had hanged the five road agents from a single beam on January 14, 1864. One report mentions that she cut a trapdoor into the attic so people could peek at the beam for a small fee. It was the headquarters of the Virginia City Water Company at least until Sarah Bickford’s death in 1931. Sarah Bickford’s example reminds us all of the strength of the human spirit, the strength of faith and will we can all call on in tough times. Woman or man, black or white, in all ages perhaps the single most important ingredient to success, and sometimes survival, is the courage to persevere. Sarah Bickford had these qualities in ample supply. This entry was posted in Wild West History on April 10, 2018 by Carol Buchanan. Carol Buchanan on Guilty or Innocent? Tom Rizzo on Guilty or Innocent? Tom Rizzo on Secrecy in the George Ives Murder Trial?